I loved the pilot of this show and haven’t seen any other pilot to beat it yet. I therefore find it extremely satisfying and relieving that the best pilot of the year turned into one of the best new series of the year too. What makes the show so good is the combination of a hugely charismatic cast and some beautifully written characters. Each character is realistically complex, constantly struggling to find balance in their lives. Everything seems a compromise for them – it’s all about what you want to do, what you should do, and what you actually have to do. 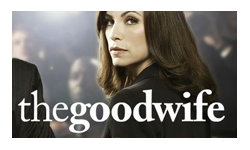 Julianna Margulies has had to wait a long time since ER for a show worthy of her talent. Last year I struggled to find candidates for Lead Actress plaudits, this year the competition is a lot stronger, but I think The Good Wife is going to win it. I imagine the character of Alicia is a gift to an actor, a really complex character, but one that appears in a procedural drama that while not light-hearted, isn’t so deep as to scare casual viewers away. The writing is wonderful, while she is clearly dealing with a lot of issues, coming at her from everywhere – her colleagues, her clients, her children, her husband – she never comes across as smothered, she still has her own personality and still occasionally manages to do what she wants to do, and have some fun along the way. Will and Diane, the senior partners at the law firm are played by two of my favourite actors. I adored Josh Charles on Sports Night and he is wonderful here – an extremely likeable, charming, playful and passionate character most of the time, but still capable of anger, pride and underhandedness (he is a lawyer after all). His relationship with his partner, the scene stealing Christine Baranski is perfect, again a fine balance of respect and competition. She has another gift from the writers – a mature, successful female professional who still has problems to deal with, yet again manages to find some fun. She’s the person Alicia could become in 20 years, and they both know it. The rest of the cast and characters are just as carefully crafted. Peter, the ‘Bad Husband’ (Chris Noth) is deliciously weasely – every time you almost forgive him he does something horrible, and every time you almost write him off, he does something lovely. Alicia’s competition at the law firm, Carey, wants to do good, but also wants to succeed. If Alicia could easily become Diane, Carey could easily become Peter. His relationship with Alicia is fascinating, being forced into a competition with her, while naturally leaning towards treating her more like a big sister. Kalinda the PI is an interesting character mostly because of her mysterious nature. I suspect i she were less secretive about her life, particularly with regard to her sexuality, she would be much less interesting. As it is though the juiciness of someone who can find out anything, about anyone and keeps everything about her own life secret creates a lot of interest. The plots of each episode are perfectly fine, I enjoyed watching them, but they were often quite predictable. The thing I was least engaged with was the big scandal story, Peter manipulating everyone to get himself out of jail and back into the spotlight – I just didn’t really care. The will-they-won’t-they relationships were all a lot of fun to watch, usually I just find that kind of thing irritating, but thanks to the great chemistry between all of the possible pairings, I really enjoyed them. This show falls perfectly into a nice little niche. It’s serious, but not too heavy; disposable, but not dull; enjoyable, but not cheesy. It’s a show you can watch proudly without having to psych yourself up to watch something ‘proper’. It’s the kind of show I’d recommend to work colleagues, my dad, my friends, even my grandmother because it’s just so easy and so satisfying to watch. The characters, the writing and everything about the show is all about balance, and it manages it perfectly.